Our group is engaged in design and development of G-APD (SiPM) based camera for 4m class telescope. This camera will be installed on vertex element of TACTIC telescope run by BARC at Mt. Abu. After successful completion of tests at Mt. Abu we plan to shift the telescope to Hanle and dedicate it for monitoring of bright blazars. 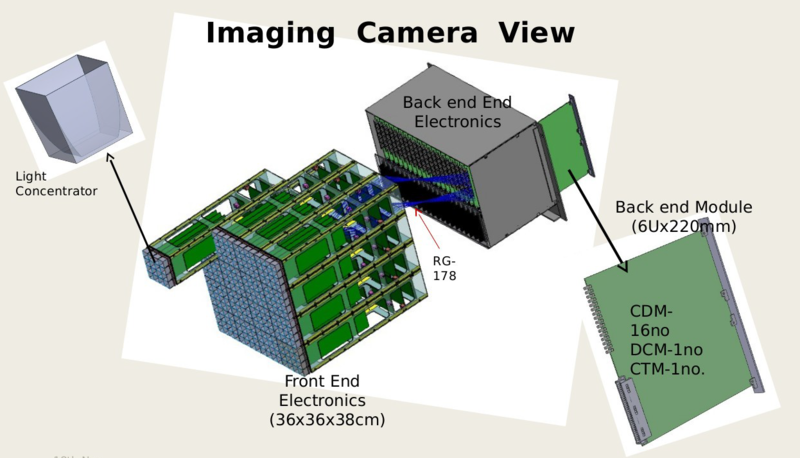 Camera is made of 256 pixels consisting of light concentrators and G-APD's. Pulses from G-APD's are given to front-end electronics. 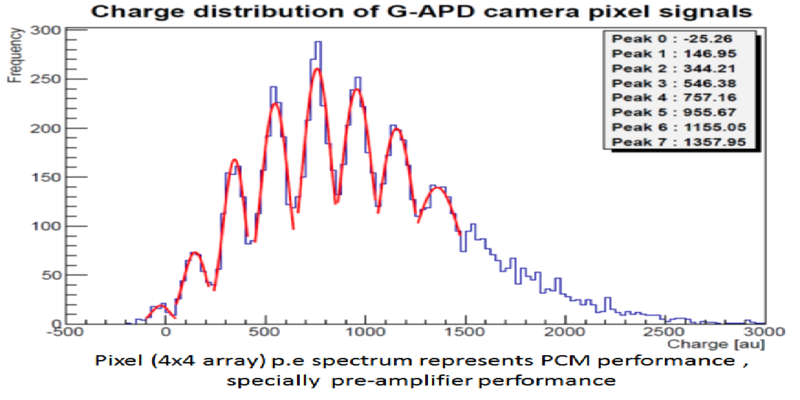 Front-end electronics conditions pixel pulses and also biases G-APD sensor (SiPM). The 256 conditioned pulses are fed to Back-end electronics for processing, digitizing and recording data on a valid trigger. The packets of data are pushed to remote servers for data archive and fast Ethernet connectivity to remote PCs is used for control and data transfer. The design goals of the camera are quite challenging ones like large dynamic range of 1-2000 photo-electrons, in-situ gain calibration using single photon spectrum in the background of large night sky photons, pulse profile recording @ 1GSPS, space and weight constraints, and camera exposure to extreme temperature range like +25°C to -25°C etc. 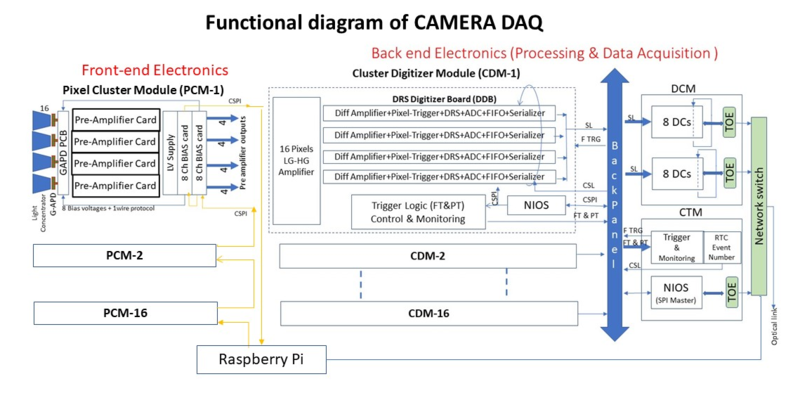 The front-end of the camera consists of light concentrators, G-APDs, pre-amplifiers, the G-APD BIAS card and low voltage supplies and is grouped into 16 identical front-end modules(PCM). A uniform stable gain for all the pixels is achieved ensuring a constant overvoltage for the G-APDs against the changes in temperature and bias current, using BIAS card. The pixel signals from the front-end electronics are taken for processing to a modular crate in the back-end of the camera. The crate consists of 16 CDMs for digitizing the pixel signals @ 1GSPS, a Data Concentrator Module (DCM) which pools data over 80Mbps serial links, Control and Trigger Module (CTM) to generate event triggers using the criterion of at-least 'm' p.e in 'n' neighbouring pixels as well as to monito/control whole Camera operation. The back-end electronics also has 1Gbps Ethernet links to remote PCs for the camera control, initialization, monitoring and also for sending the pooled event data from DCM. The intelligence and flexibility is achieved using micro-controllers and FPGAs with soft processors. Several interface standards viz. customized SPI, Ethernet link etc. will be used in the camera for a total operational integrity. Several GUI based programs (developed using Qt-root under Linux) interlinked over Ethernet will be running in control room PCs for the control, monitoring and data archive of the camera. 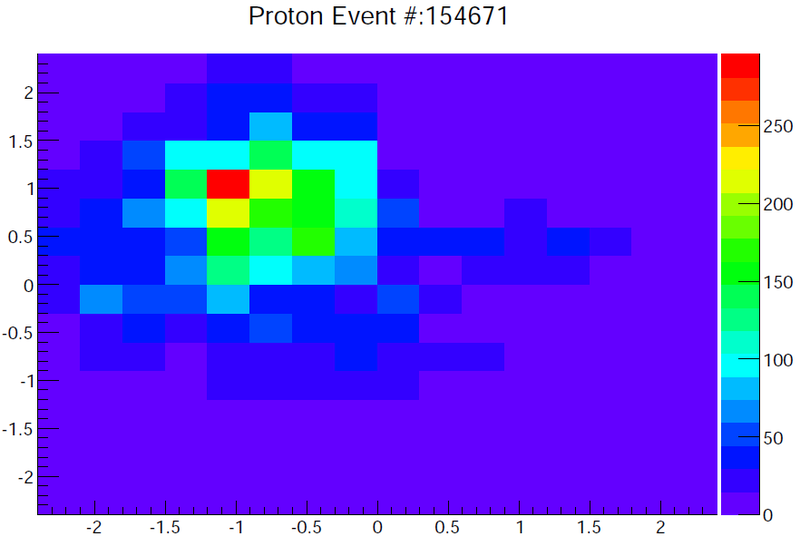 The simulations of extensive air shower initiated by Gamma and proton primaries are carried out at an altitude of 4300 m using CORSIKA7.35 package. 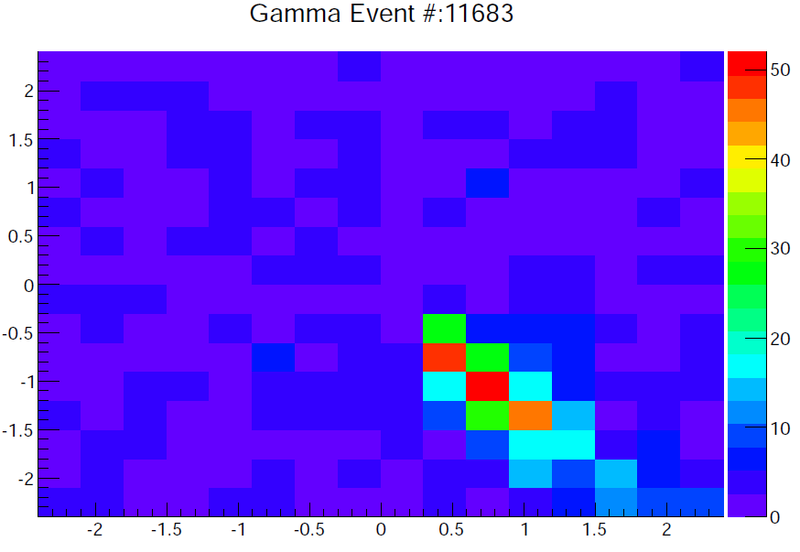 Cherenkov images at the focal plane of the telescope are simulated using CORSIKA output and G-APD camera details. 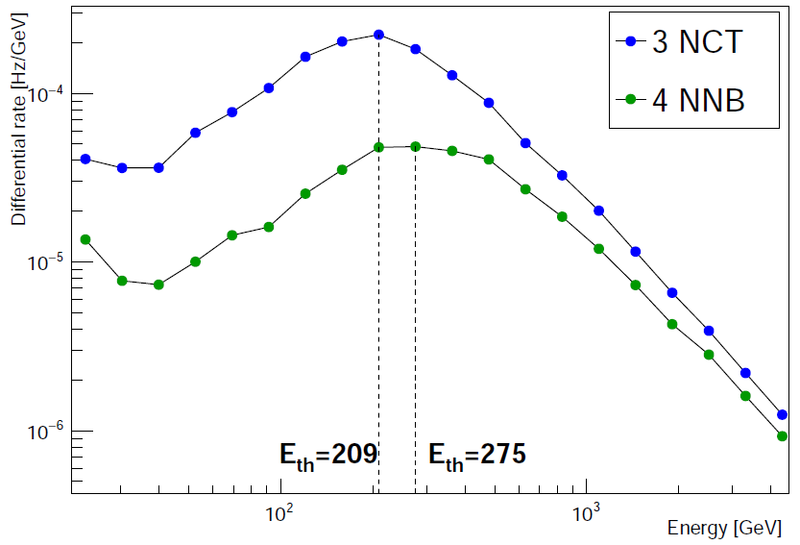 Estimated energy threshold for two different topological trigger conditions, three noncolinear triplets and four nearest-neighbors.